Hello everyone! As you all well know I love matte nails, so I couldn't let one of my favourite manicures go un-mattified could I? I preferred these matte in person, though through the photos I prefer them glossed. I'll let you make your mind up which looks better. I also got asked quite a few times last night for a tutorial, which will be coming up in the next week or so :) I really debated whether to put these up here because I dont want to bore you with the same manicure 3 times but I hope you like them! What did you use to mattified? I've been looking for a good matte top coat. 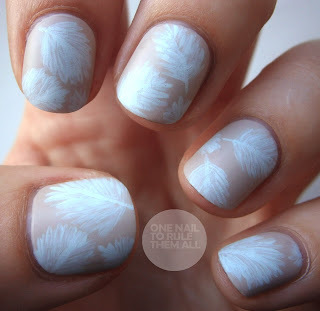 This Nail Art is so delicate!